Thelma Biotel Turns 10 Years Old! Thelma Biotel AS became an independent company on December 11th, 2008, making this our 10th anniversary! It’s incredibly inspiring to look back into the history leading up to these ten last years of independence. The direct roots go all the way back to 1969, when Professor J. G. Balchen started applying automatic control theories to investigate the behaviour of fish in its natural environment. In 1970 the Royal Norwegian Council for Scientific and Industrial Research granted the Department of Engineering Cybernetics at the Norwegian Institute of Technology (NTH) and SINTEF funds for fisheries research and practical fisheries studies. A state-of-the-art research facility was established in Hopavågen, outside of Trondheim. Balchen spent much of his time from 1970-1981 studying the physiology and behaviour of fish in the open sea, trying to model and control fish behaviour. To accomplish this, a wide range of objective measurements were required to obtain knowledge about the fish’s physiological and biological behaviour. This is where Bård Holand and Inge Mohus enters the scene. From 1973 Bård Holand and Inge Mohus was hard at work with acoustic telemetry together with Balchen, developing instrumentation useful for a broad range of fisheries research. 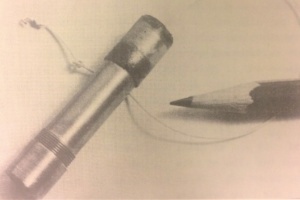 The main research program was simply called “Fish Telemetry”. Already in the first year, they were able to build upon what was available from earlier fisheries research and construct ground-breaking biotelemetry instrumentation to enable rather advanced studies of free ranging, individual fish. 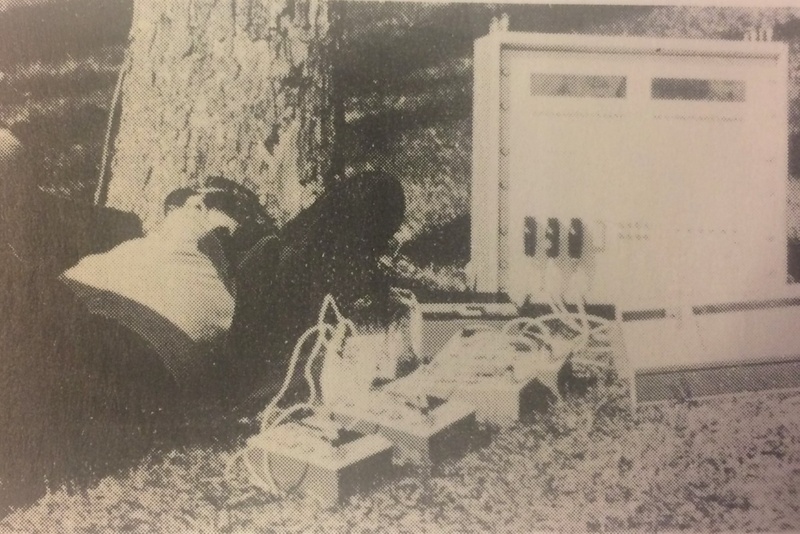 By 1975 their detailed reports show that Holand and Mohus had developed several analogue acoustic transmitters which measured variables such as depth, temperature, heart-beat and tail-beat. Additionally, they had developed receiver equipment including both omnidirectional and directional receiving hydrophones, an ultrasonic signal decoder to support a wide span of frequencies below 100 kHz. The decoder receivers could be connected to buoys equipped with radio transmitters, allowing for wireless transfer from sea to shore. Holand and Mohus also developed a fully automated fish tracking system called PinPoint. The PinPoint system used the same principles as our modern PinPoint does today, and the name pays homage to their early efforts. The first PinPoint system used hundreds of meters of cables and a series of special designed electronics. The main computing unit was connected to a paper chart plotter which drew the fish’s track on a paper. A floppy-disk rotating mass memory allowing the plot to be stored and replayed at a later time. The production of tags and receivers enabled remained within the research company SINTEF and a lot of exiting studies with different species from salmon to seals and whales where performed in the last decades of the millennium. In 2001, Bård Holand commercialized the technology, and started Thelma AS. The tag development program was geared towards larger production and smaller and more efficient digital tags with more effective signal coding was developed. Thelma AS did not only specialize in acoustic telemetry products, but also in deep water commercial diving equipment and so on. The lack of focus eventually leads to the company breaking apart into independent brands and this is where Thelma Biotel emerged in 2008. 2014 was the start of Thelma Biotel as we know it today. Major restructuring of the company was done, and new strategies were implemented. From 2014 to 2018 we’ve seen almost 8 times increase in revenue. Much of the success is due to new technology and services being developed. Especially our digital multi-frequency receiver, the TBR 700 and following software. Tags has and the miniature acceleration and depth tags which enables new species and settings to be explored. We are excited for the future and to keep up the pressure on development!